With countless cocktails, starters and desserts available, even the healthiest eaters tend to tip towards the unhealthy at parties. 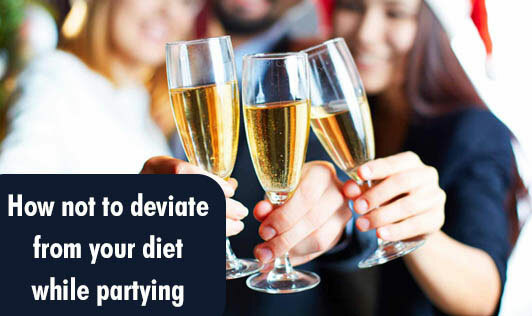 However, with a few simple tips, you can prevent total derailment of your diet and enjoy the party too. Here are a few tips to help you watch your calories while you party hard. Eat before the party. Don’t starve yourself before the party. Have a hard-/soft-boiled egg, a fruit, a sandwich, or grilled chicken before leaving, to avoid binging later at the party. Say no to starters the first time. Say no to starters in the first round and see what is being served, before taking any. Chances are that there will be better options that may come around the next time. Consider your appetizers to be a meal. If you are gorging on a 400-calorie appetizer, consider it as your meal and don’t think of a real meal again. Survey the buffet before you fill your plate. With so many rich foods around, you may just start piling on the food. Stop, weigh your options, and serve yourself a controlled portion. Track what you’re eating. Avoid eating mindlessly when the food is spread out in front of you, as you may not realize the calories you’re taking in. Also, avoid making conversation while eating as you may lose track of your intake. Share those calories. Sharing those rich desserts with friends or family will definitely cut down on your calorie consumption. Choose a smaller plate to eat. Choose a smaller plate to eat or commit yourself to just one round of the buffet, and also avoid piling food on your plate. Limit your alcohol intake. Also, alternate your drinks with water or any other low-calorie drinks. Arrive late at the party. One of the best tricks is to arrive late at the party, once everybody has finished with high fat foods, and guests are more interested in mingling with others than loading their plates with food. This trick will help you stay away from the buffet and mingle with guests. Lastly, drop the guilt if you slip up and make sure you get on track the next time you party.